No doubt, you’ve heard about the latest irresponsible fiscal/monetary proposal to be floated by members of Congress and the erstwhile economist, Paul Krugman, whose lunch was just eaten by Jon Stewart. It entails having the Treasury avoid the federal debt limit by handing the Federal Reserve a single $1 trillion platinum coin. The Fed would then credit the Treasury’s bank account with $1 trillion, which the Fed could spend on the President’s lunch, a $200 toilet seat, a new aircraft carrier, more Medicare spending – anything it wants. Is there anything special about platinum? Well, yes. The coin doesn’t have to contain $1 trillion worth of platinum. It can be microscopic for all the Fed cares as long as they can use a electron microscope to read the $1 trillion "In God We Trust" inscription. But it has to be made out of platinum. No other metal or substance, like a piece of pizza, will do. The reason is that the Treasury has the right, by an obscure law, to mint platinum coins, but only platinum coins. Otherwise, making money by making money is the Fed’s domain. Countries that pay for what they spend by printing money or, these days, creating it electronically, are usually broke. That certainly fits our bill. Our country is completely, entirely, and thoroughly broke. In fact, we’re in worst fiscal shape than any developed country, including Greece. We have fantastically large expenditures coming due in the form of Social Security, Medicare, and Medicaid payments to the baby boom generations – I.O.U.s, which we’ve conveniently kept off the books. When the boomers are fully retired, Uncle Sam will need to cough up $3 trillion (in today’s dollars) per year to pay us (I’m one of us) these benefits. To put $3 trillion in perspective, it’s 1.5 times Russia’s GDP. These benefits are called entitlements because, presumably, we feel we are entitled to hit up our children to cover their costs. Borrowing from them and letting them tax themselves and their kids to pay themselves back is a good trick, but it’s running afoul of the debt ceiling. Taxing them more and promising to the pay them benefits they’ll never receive is an old trick that’s run its course. So we’re now onto printing money that will, we hope, raise prices only after we have protected our assets against inflation. And we’re printing lots and lots of money. 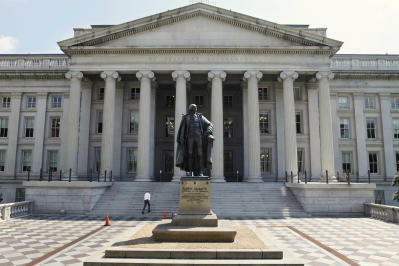 Indeed, over the past five years, the Treasury has, in effect, done its $1 trillion coin trick twice. Well, substitute a $2 trillion piece of paper called a Treasury bond for the platinum coin. Suppose the Treasury prints up such a piece of paper and hands it to the Fed and the Fed puts $2 trillion into its account. No difference right, except for the lack of platinum. Next suppose the Treasury doesn’t hand the $2 trillion bond to the Fed directly, but hands it to John Q. Public who gives the Treasury $2 trillion and then hands the bond to the Fed in exchange for $2 trillion. What’s the result? It’s the same. The Treasury has $2 trillion to spend. John Q. Public has his original $2 trillion. And the Fed is holding the piece of paper labeled U.S. Treasury bond. Finally, suppose the Treasury does this operation in smaller steps and over five years, specifically between 2007 and today. It sells, i.e., hands to John Q. in exchange for money, smaller denomination bonds, which Johns Q. sells to the Fed, i.e., hands to the Fed in exchange for money. Further, suppose the sum total of all these bond sales to the public and Fed purchases of the bonds from the public equals $2 trillion. Voila, you’ve got U.S. monetary policy since 2007. In 2007, the monetary base – the amount of money our government printed in its 231 years of existence totaled $800 billion. Today it totals $2.8 trillion. And it increased by this amount via the process just described – the Treasury’s effective minting out of thin air two $1 trillion platinum coins. Now what happens when the Treasury spends its freebee money? It raises prices of the goods and services we buy or keeps them from falling as much as would otherwise be the case. Either way, the money we have in our pockets or in the bank or coming to us over time as, for example, interest plus principal on bonds we’ve bought in the past – all this money loses purchasing power. So we are effectively taxed $2 trillion. What the advocates of the $1 trillion coin are, therefore, proposing is to tax us in a hidden way. This is not just taxation without representation. It’s also taxation with misrepresentation. The fact that a Nobel Laureate in economics would propose this without making clear this fact raises the question of whether his prize should be revoked. Lance Armstrong, after all, is losing his medals for discrediting his profession. Perhaps the Nobel committee should consider taking back Krugman’s. This is no innocent omission. Every PhD economist is taught about seigniorage. It’s a term that was coined (excuse the pun) in the 15th century and stems from the right of feudal lords – seignurs – to coin money, use it to buy, say, chickens and debase the purchasing power of the coins they had given their serfs in the past for, say, wild boar. Today, 12 cents out of ever dollar being spent by our government is being printed. As indicated, the money supply has more than tripled. While inflation, let alone hyperinflation, has not yet occurred, everything is in place for this outcome. If you want to see what things will look like, check out Zimbabwe, which has surely been reading Krugman’s articles. Laurence Kotlikoff is an economist at Boston University, co-author of The Clash of Generations, and President of Economic Security Planning, Inc.